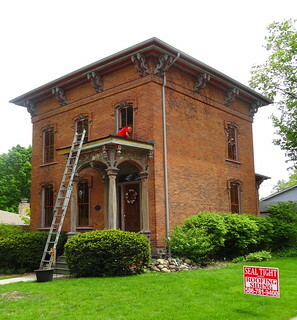 We are in the Village of Romeo, there’s an estate sale at the former Prospect Hill Bed and Breakfast at 439 Prospect Street. 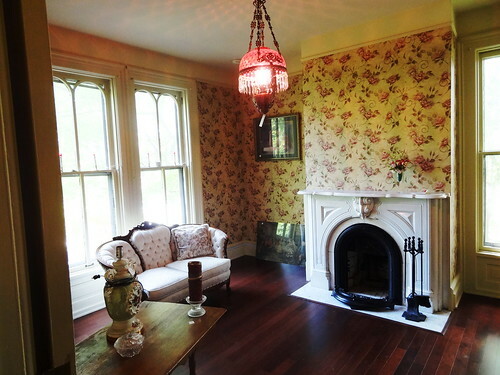 We’ve always wanted to see the inside of this 6,000 sq. ft. beauty, today’s our chance. We park on the street and approach the hill-top property, curiosity-seekers and shoppers enter and exit through the front doors. 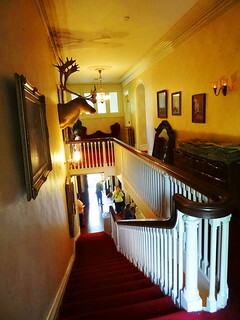 The imposing structure is quite lovely, immediately in the entry way a staircase leads us up, we make our way from room to room noticing antique light fixtures, wide moldings surrounding the ceiling and doorways and the unique feature of inset sinks in the bedrooms. 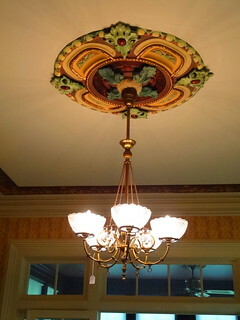 Fireplaces are marble, floors are wood, medallions grace a few of the ceilings. Everything is for sale. Having satisfied our curiosity we decide to take a stroll through the neighborhood. 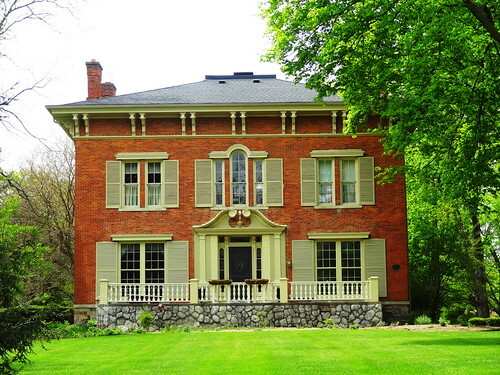 The area now known as Romeo was originally inhabited by Chippewa Indians and called Indian Village, as more and more people moved into the village homes were put up, businesses began to grow; the town was re-named Romeo in 1838. 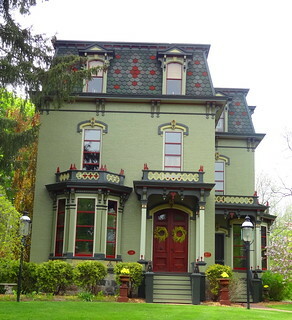 Much of the architecture you see today dates to the 19th and 20th centuries, most of it Victorian in style, including the picturesque downtown. 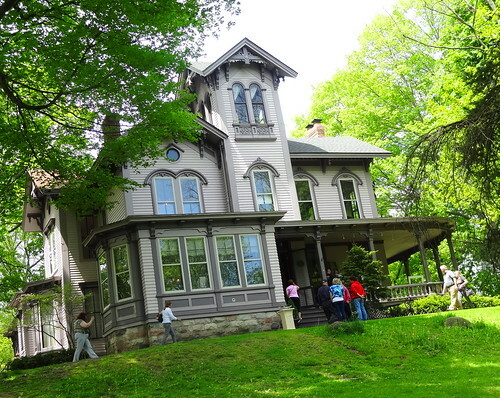 The entire Village of Romeo is listed on the National Register of Historic Places. 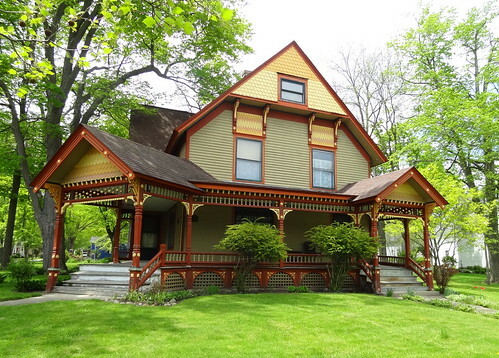 We stroll up and down Main Street, beautiful Queen Anne homes sport lattice, spindles, fish-scale and shake siding. 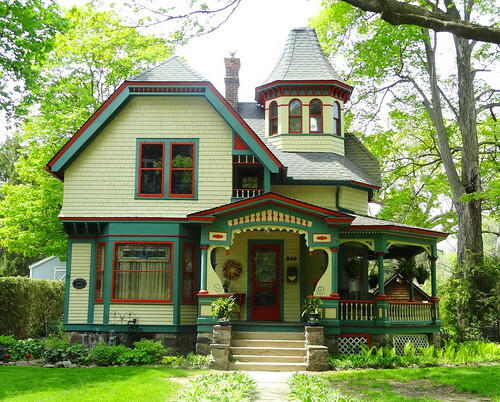 Elaborate paint schemes make the most of architectural details, porches are large and inviting, baskets of flowers hang above. 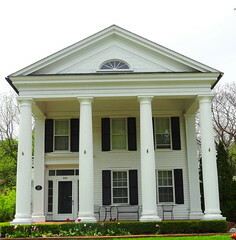 Throughout the neighborhood homes have leaded glass windows, graceful columns, stone is a popular feature whether used for a chimney or the lower level of a house, I like the way it looks. Flowering trees are still in bloom, lawns are deep green and lush. 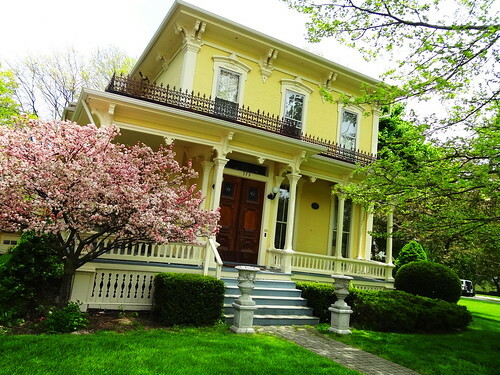 Greek Revival and Italianate styles join the Queen Anne’s with their colorful exteriors. We spy a pale yellow home with the fanciest trim I think I’ve ever seen, from the distinctive columns and window pediments to the third-story dormers and decoration under the eaves, it’s spectacular. 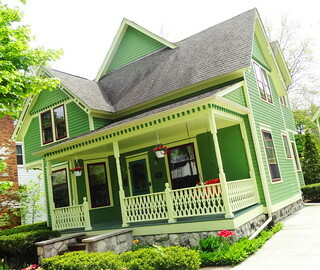 The green Second Empire at 240 Sisson is gorgeous, as are so many of these well cared for homes. 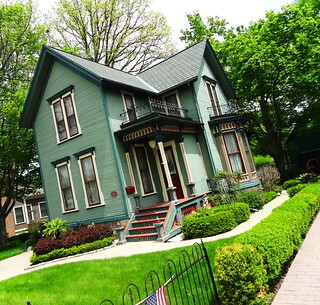 Romeo still maintains its agricultural history with farms and orchards throughout the city. 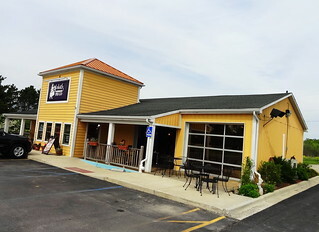 A short drive and we’re at Blake’s Ciderhouse and Winery in Armada for lunch. Gerald and Elisabeth Blake along with their 13 children started the historic farm back in 1846, they now have over 500 acres of orchards and farmland. The business has passed down through the generations and is one of the most popular cider mills in the area. 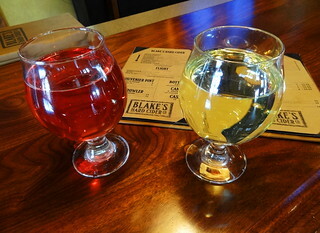 With the addition of hard cider, wine and beer a whole new clientele is being introduced to the Blake’s family. 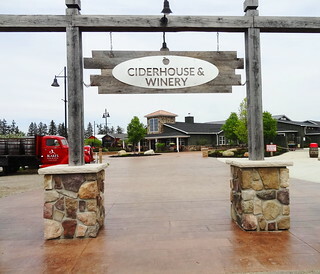 The Ciderhouse and Winery is housed in a charming, rustic-looking building. The interior is an attractive mix of wood, wrought iron and decorative concrete, a large open fireplace rests in the center of the room. 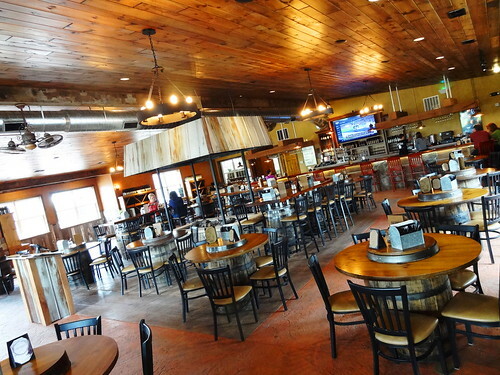 Wood shelves and cabinets hold craft ciders in glass bottles and aluminum cans, wine is sold by the bottle in several varieties.We have a seat at the bar, check out the latest ciders and place our order. I am having the Cransylvania Cider, a mix of blood orange and cranberry, it’s refreshing and delicious. Kris is drinking the Flannel Mouth, a nice, sweet apple-y hard cider. 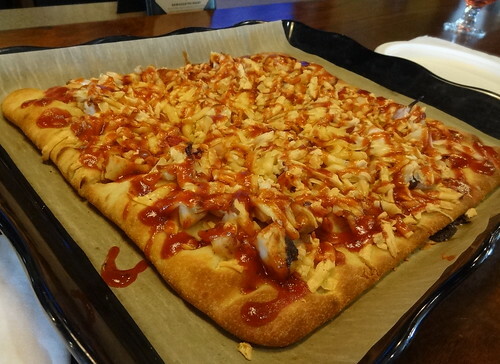 Our bbq chicken flatbread arrives; a sweet tangy bbq sauce is layered with chicken, smoked gouda cheese and sliced red onion, yum! 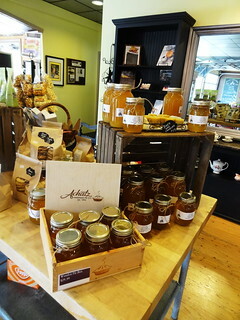 Have to leave room for dessert…..
Achatz Handmade Pie Company has been making pies using recipes passed down through the generations since 1993, we are at the North Ave location in Armada. If you have seen the name but aren’t sure how its pronounced, it rhymes with jackets. The space is homey, comfortable, shabby chic, vintage items are re-purposed as shelving and displays. 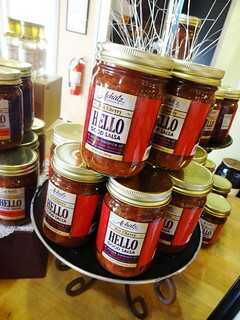 You can purchase salsa’s, salad dressing, jam, honey, popcorn and of course pie! 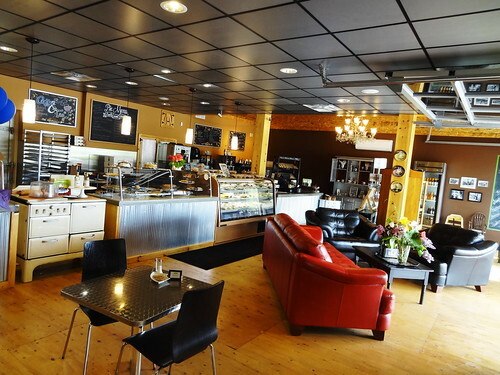 The length of the room is one long string of tasty offerings from homemade soups to desserts. There’s a lot to choose from so we have to give this some serious consideration, we finally agree on the Turtle Cheesecake. We order a slice at the counter along with espresso for Kris and tea for me. We take our tray to a seat by the roll-up door. 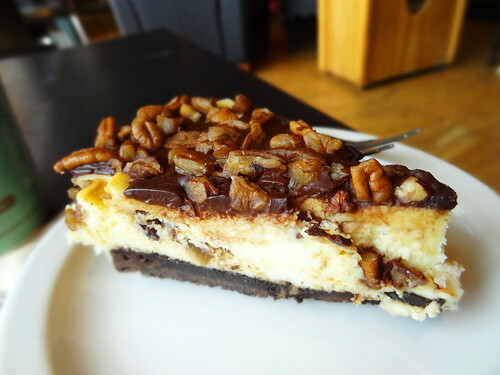 The caramel cheesecake rests on a chocolate crust then is topped with a chocolate ganache and pecans, rich and delicious. We take our time enjoying our sweet treat, the afternoon sun and the breeze coming in through the door. Life is Good.